Similar to the deal yesterday to Mexico City, Aeromexico has now dropped the price of their roundtrip flights from Toronto to Cancun, Mexico down to $323 CAD roundtrip including taxes. The flights have 1 stop each way (in Mexico City), with a reasonable layover time (2 hours). a. You can try clicking through from Google Flights to the Aeromexico website. However, it seems to always default to booking in $USD when you do this. The price will show up as $245 USD roundtrip. You may want to try going to the Aeromexico website directly, and clicking on 'United States - English' in the top left corner, and changing it to 'Canada - English'. Now try searching for the same dates, and the prices should show up in $CAD. b. You can also try taking the same dates you found on Google Flights, and searching for this fare on Expedia.ca - who are showing it for $323 CAD roundtrip. 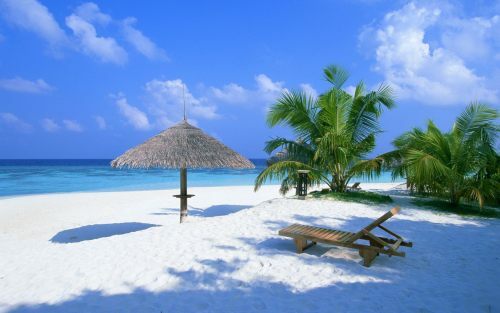 toronto, yyz, flight deals, cancun, mexico, cun, north america and aeromexico. 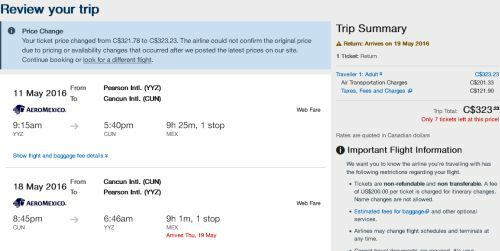 One Response to "Toronto to Cancun, Mexico - $323 CAD roundtrip including taxes"